The scan for (USB) disks is now as fast as possible. But, if you have many disks connected and you notice a long delay in their scan, could be from the security solution. For example I noticed that Comodo Internet Security delays every access to each removable disk with a few hundred ms. It may not seem much, but when you have a few disks connected and VMUB accesses each of them 2..3 times (to get all their data), it will become noticeable (but not very annoying). I advise you to notify the security solution support so they can fix the problem. 1. For most of the security solutions, deactivating it from its icon in tray won't help. For Comodo I had to uninstall it to get rid of the delay. 2. When the delay from the security solution is gone, VMUB accesses each disk in a matter of ms. When it launched I noticed that no drives were green even though before one was (as locked by QEMU - so OK - expected). I edited a VM entry to add the USB drive that was already connected and then ran it. OK if I quit QEMU so drive no longer locked by VMUB. Can message box be improved? 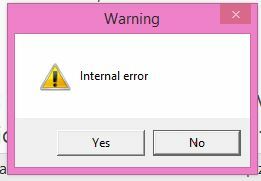 If I understand correctly, the only problem here is the message "Internal error"? Yes, sorry, I was not very clear (I didn't realise QEMU+VMUB was running at first!). It's just the message and not knowing what Yes and No would do. In C the format string functions accept %c for character and %s for string. In Delphi it's %s for both. 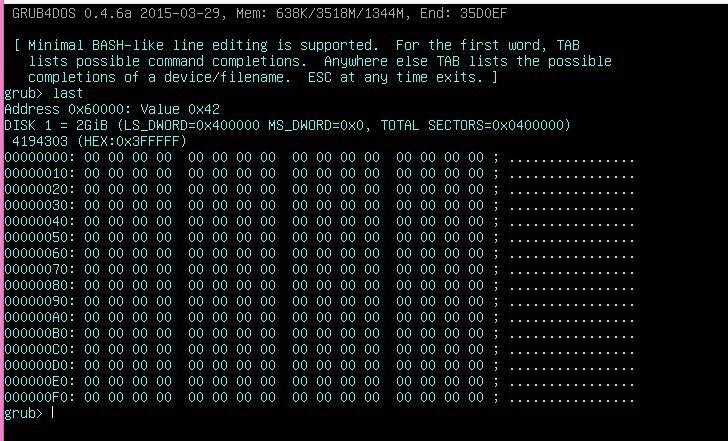 If using VBox to boot from grub4dos USB drive, when reading sectors from the end of the USB drive (flash removable USB 3.0 NTFS), it returns all 00's for the last 80 odd sectors and not the correct sectors. The problem occurs just under VBox (no VMUB used) as well as using VMUB+VBox. I put marker bytes in the last sectors so I could tell if the correct data was returned. Under VBox+booting to WinPE however, a disk editor does return the correct data. 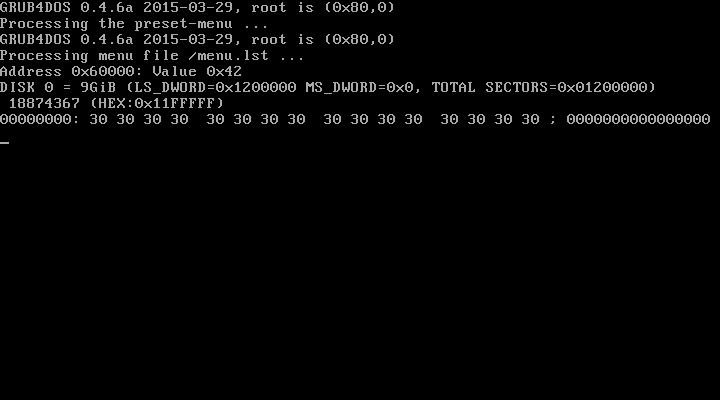 Under QEMU with grub4dos, the correct data is returned. So maybe it is a Vbox-BIOS bug? On my computer I use both real and virtual disks (vhds, mounted with vhdmount.exe from Microsoft Virtual Server) to test grubinst. 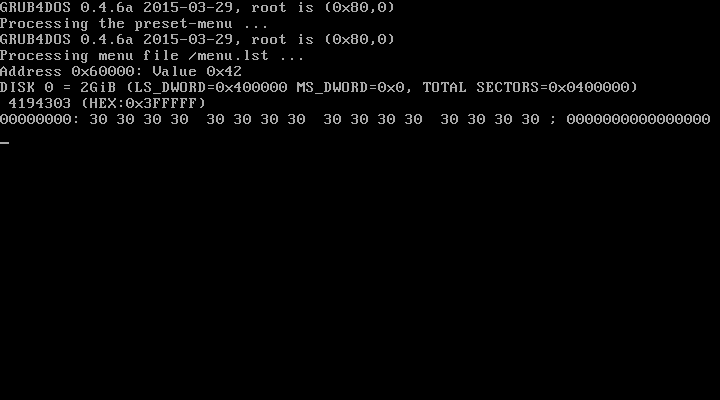 I got the same results in QEMU. Or should I test in a different way? Which version of VirtualBox are you using? I tried a 8GB FAT32 USB drive as well - it returned data, but not the right sector. Edited by steve6375, 02 April 2015 - 12:55 PM. P.S. The partitions on the USB disks do not go right to the end, there is some 'unused' space at the end of the disk. P.S. I can also access sectors (presumably not real ones though?) past the end of the USB drive too! The 2 and 9 GB disks have the same issue. The real disk was partitioned 'till the end. Don't use it directly in VB; install a vhd mounting tool like WinVHD, mount the vhd on the real computer and then use it in VMUB just like a real disk. Sorry for delay, some things came up and also I could not get WinVHD to work. It installed and I got systray, but right-click on VHD does not seem to show any menu item for it and I can't see how to add it using the app form itself??? Anyway, I used Win DiskMangelement to attach the VHD and uses it as disk 1 with the E2B USB disk as disk 0. Is it only me then? 'Also you can attach or detach your disk's by right mouse button WITHIN THE APPLICATION'S FORM.' _ I thought it would add it to the right-click context menu! Edited by steve6375, 02 April 2015 - 05:23 PM. OK- it works if the disk controller is IDE - the problem occurs if the VM controller is SATA! too late! Why would they want to discourage people from using their software anyway (rhetorical Q!). I know this thread is 2 month old now but I figured that since I found a solution to a problem others might have, better to post it here. 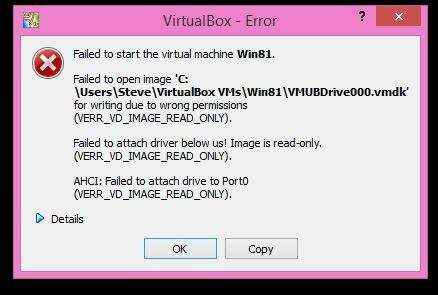 With version 1.51 (portable) and using vbox 4.3.28 I got the error "VERR_ACCESS_DENIED" just as vbox launched. After some research (mainly on vbox forum), it appears that some user had the same problem with post 4.3.12 versions. So I installed vbox 4.3.12 and it worked. A little precision though... I restored a clean system via an acronis image beforehand. This was in the context of testing imagix related stuff on some syspreped win7x64-pe usb-stick. I tried the createrawvmdk command before landing on this website and it also gave me an error of somekind but later (while windows was loading), even with vbox 4.3.12. Anyway thank You DavidB your app is excellent. well, it was my idea for include the support in the VBox for an USB-Device ..
so, why not, i tell it you, they want not an System on usb like an Linuxderivat ..
why makes not more easy to create something and supporting something.. i say it to you..
can you boot any computer with your system.. should i tell you more ? You can put your system in your House and in your Car and can make many more with it..
and some peoples want it easy not, they want hold it on place for more easy catching if some peoples it not want ..
it is easy for build up an usb-stick for anybody, also for young and normal peoples it is really more hard for controlling it..
"they" dont want "us" to have this capability, youre right! another reason is tracking and control. 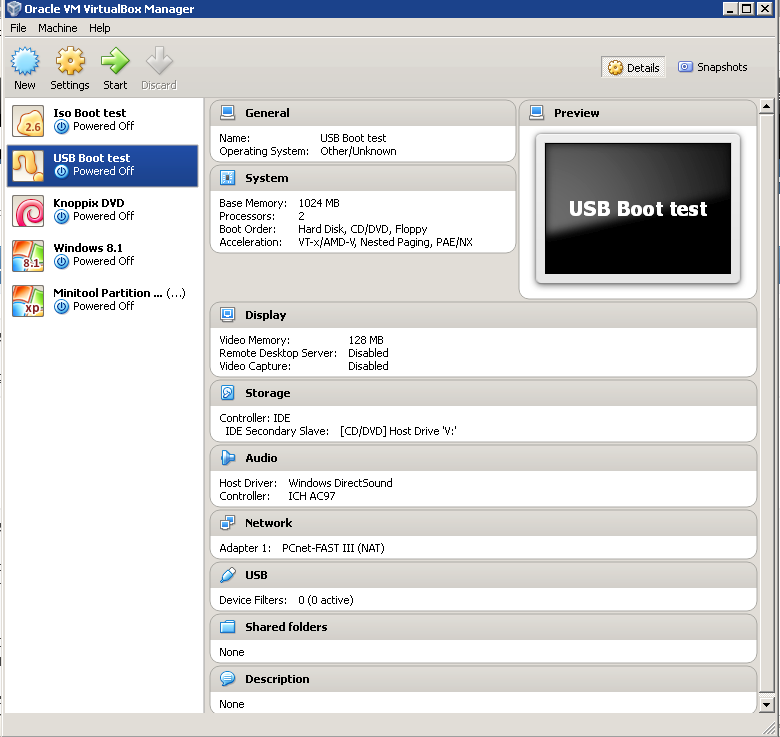 one of the big deals with DavidB's creation here is that you can boot an install usb in VM to install a windows on another USB! all through VM and if configured tightly there will be no traces of the actual hardware these windows were installed on. this tool is superb but I dont think many realize just how superb it is. nope, they realize it not and all the "normal" Peoples (Users only) don't realize it also ..
because they're are not so deep in the software technical ..
the want it easy use and should work on the easiest way ..
because, it's not in the sense of the founder.. you know maybe something also.. .. i hate some adjusting..
because, it's not really open and don't let make an really free way and try in one or other way ever to controlling it..
bahh.. something it's not "cosha" and it contradicts the open source way .. imho ..
Producers for make it more modern of the stand the technicals ..
and the normal harddsisk's be never really interesting .. because any can take with his own harddisks on /as USB-Stick..
this would be the best .. I bet, it's comes, but behind the sdd's they want sell mass of hardware up to this possibility, i want bet. usb3 is there and sdd's comes now .. should i say more? ..